BEIRUT (AP) — A slogan painted in small letters on a school wall reads, "We the people want Syria to be a civil, democratic state." Scrawled next to it in bigger letters is the response from an unknown Islamic hard-liner: "The laws of the civil state contradict the Islamic caliphate." A quiet power struggle is taking place in the eastern Syrian city of Raqqa ever since a Muslim extremist faction of the rebels swept in and wrested the town from the regime nearly four months ago. Armed men wearing Afghan-style outfits patrol the streets, raising black Islamic banners at checkpoints instead of the rebellion's three-star flags. But moderates are trying to counter the extremists' tight grip, establishing dozens of newspapers, magazines and civil society forums in an effort to educate the roughly 500,000 residents about democracy and their right to vote. Raqqa, the first and only provincial capital to fall into rebel hands, is now a test case for the opposition, which has wrestled with how to govern territories it has captured amid Western concerns that Islamic groups will hijack power if President Bashar Assad is ousted. The tensions reflect a wider struggle going on in the rebel movement across Syria, where alliances of Islamic extremist brigades have filled the void left behind whenever Assad's forces retreat, while moderate and secular rebels have failed to coalesce into effective fighters and the opposition's political leadership has failed to unify its ranks. The rebel capture of Raqqa on March 5 consolidated opposition gains in a string of towns along the Euphrates River, which runs across the desert from the Turkish border in the north to the Iraqi border in the southeast. Even so, the momentum on the battlefield over the past few months has been with regime, aided by Hezbollah fighters from Lebanon. More than 93,000 people have been killed since the Syrian conflict began in March 2011, according to the U.N. — though a count by activists puts the death toll at over 100,000. Two extremist factions, Ahrar al-Sham and the al-Qaida affiliate Jabhat al-Nusra, or the Nusra Front, led the push into Raqqa, which fell relatively quickly after a campaign that lasted less than a month. Most of the Jabhat al-Nusra fighters in the city are foreign jihadis, while the Ahrar al-Sham fighters are Syrians with a jihadist ideology. Other opponents of the Assad regime in the city have been put off by what they see as the extremists' unnecessary brutality. In the days after seizing the city, the Muslim brigades brought captured security forces into public squares, killed them and drove their bodies through the streets. 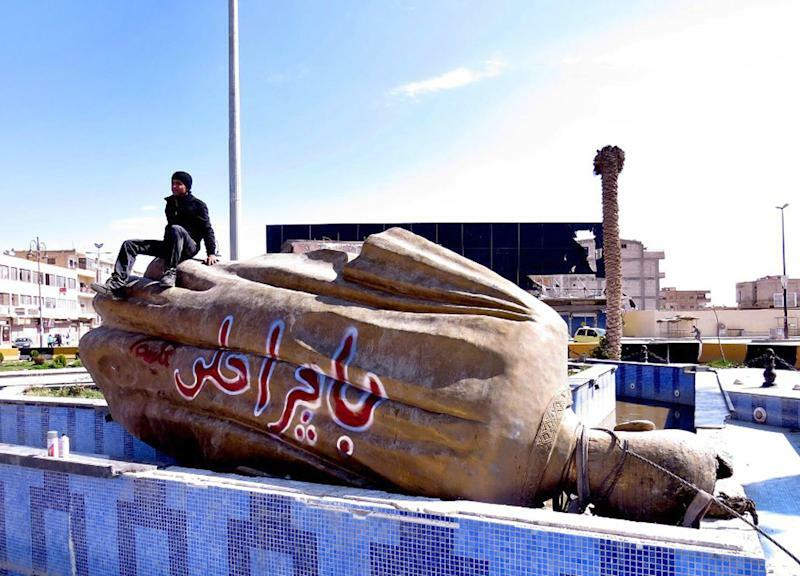 Then in May, fighters affiliated with al-Qaida killed three men described as Shiite Muslims in the city's main Clock Square, shooting them in the back of the head. In a speech to a crowd that had gathered, a fighter said the killing was in retaliation for the massacres of Sunni Muslims in the town of Banias and the city of Homs, both in western Syria, according to online video of the scene. The statement was made in the name of the Islamic State of Iraq and the Levant, a merger of Jabhat al-Nusra and Iraq's al-Qaida arm announced in April. Armed gunmen with their faces covered in masks shot pistols and rifles wildly in the air in celebration after the three men were killed. They wore clothing favored by Afghanistan's Taliban and Arab mujahedeen who fought in that country — a sign that they belonged to Jabhat al-Nusra. The Shiites "were executed in front of everyone, young and old," said Mohammad Shoeib, an activist, recalling how for several hours, nobody dared approach the bodies to take them for burial until a nurse did. The nurse, Mohammad Saado, was assassinated by unknown gunmen the next day, Shoeib said. Other activists corroborated his account. "Executing people in this manner in a public square and killing Saado was unacceptable and turned many people against them," Shoeib said. "Our revolution was against oppression and we don't accept such actions under any circumstance." Activists set up a mourning tent in the same spot where the three were executed, receiving mourners for three days in a sign of their anger. "They didn't like it," he said of Jabhat al-Nusra, "but people demonstrated their right to an opinion and they should respect that." Shoeib, 28, is one of the directors of "Haqquna," Arabic for "It's Our Right," an organization founded about three weeks after Raqqa fell that aims to educate people about democracy. The group's logo is a victory sign with the index finger bearing an ink mark, signifying the right to vote. The logo can be seen on walls in the city and on leaflets distributed by the group. More than 40 publications have popped up in Raqqa, including newspapers and magazines as well as online publications, many of them run by young activists. Many recall with pride the day rebels overran their city, about 120 miles (195 kilometers) east of the commercial capital of Aleppo, after capturing the country's largest dam and storming its central prison. 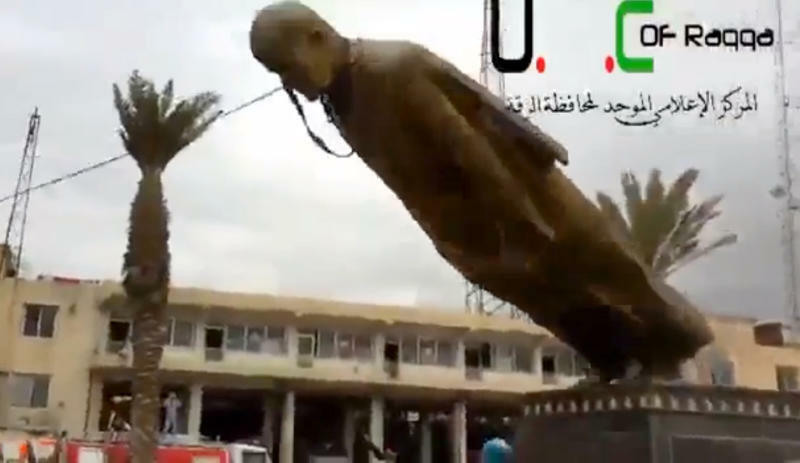 On March 5, cheering rebels and Raqqa residents brought down the bronze statue of the late Syrian President Hafez Assad after tying a rope around its neck. Others tore down a huge portrait of his son, the current president. It was a striking scene in a city once considered so loyal to the regime that in November 2011 — early in the 2-year-old uprising — Assad prayed at Raqqa's al-Nour mosque for the Muslim holiday of Eid in an apparent attempt to show that the regime was fully in control there. Activists like to compare Raqqa with Benghazi, the first major city in Libya to revolt against Moammar Gadhafi and fall into rebel hands. But unlike Benghazi, which then became the rebel capital and the heartland for the militias of the months-long civil war in Libya, Raqqa feels sequestered and insecure. Regime warplanes still swoop down at random, shattering the calm with punishing airstrikes on opposition-held buildings. Schools have closed and government employees have not been paid their salaries in months as a form of punishment. Residents complain that the main Western-backed Syrian opposition group, the Syrian National Coalition, has paid no attention to the needs of Raqqa. "The opposition groups are too busy fighting each other," said one owner of a sweets shop in the center of Raqqa. "They have not sent anyone to ask about our needs, nor is there any contact with any of them." In March, the Coalition elected an interim prime minister, Ghassan Hitto, tasked with forming an interim government that would help administer rebel-held territories in northern and eastern Syria. But the opposition has been plagued with infighting, and Hitto has been effectively sidelined. Khalid Salah, spokesman for the Coalition, insisted the opposition was trying to support Raqqa despite a lack of funds and other resources. He said the city was receiving aid from the Coalition but that it was unmarked so many people are unaware of its origin. "We are trying to step up aid and make up for some shortcomings in the next weeks," he said, adding that regime airstrikes around the city made the work more difficult. Rebel groups, particularly Ahrar al-Sham, administer daily life in Raqqa, setting up bakeries, keeping electricity and water going as much as possible and distributing aid they receive from international supporters. They have set up courts that impose Islamic law, mostly dealing with financial disputes and criminal cases such as kidnappings and theft. Many residents are grateful, saying the Islamic brigades are simply making up for the shortcomings of the opposition in exile. Mouaz al-Howeidi, a 40-year-old programmer and Web designer-turned activist, said it's promising that the power struggle has itself not turned violent. But he said civil groups were at a disadvantage because the rebels have more means at their disposal to get their message across, through mosques and by controlling the city's resources. "They control everything in Raqqa," he said. "And they have weapons and money — this makes everything easier." The owner of the sweets shop, who declined to be named for fear of reprisals, said Islamic groups were the flip side of the regime. "Raqqa has not been liberated. 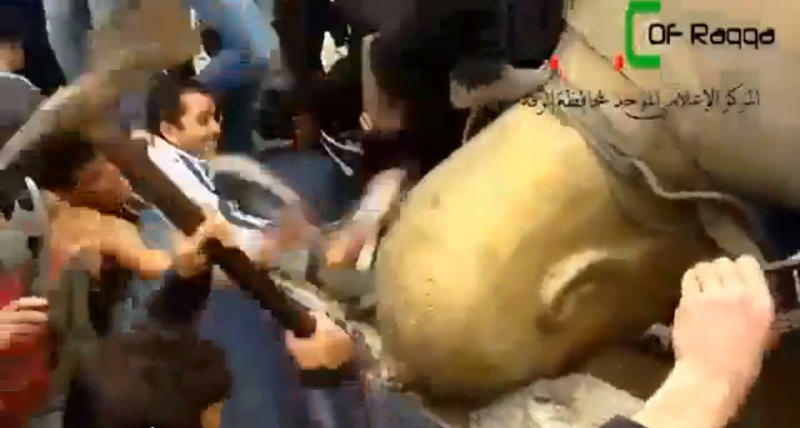 It has been re-occupied by the Islamists." A Syrian journalist contributed from Raqqa.